Dig is the result of a residency and commission I received to make a long-lasting piece of public art for the Irwell Sculpture Trail. The River Irwell flows 30 miles from Manchester in the industrial heart of the UK, north onto the moors near Bacup. All along its length environmental art has been sited which relates to differing aspects of the locality. I wanted to make an outdoor sculpture for Clifton Country Park (just north west of Salford ), which would be redolent of the amazing local industrial archaeology: there are the incredible sandstone tunnel system and inverted siphon of James Brindley’s hydraulic invention. At the far end of Clifton Country Park there is a disused aquaduct with wooden slots in its sides which carries lock gates. There are the traces of 2 collieries, miles of canals both above and underground and starvationer boats, traditional mine boats used to haul coal through the canal system. The name starvationer derives from the interior ribs which are visible in their construction and they are now very rare. 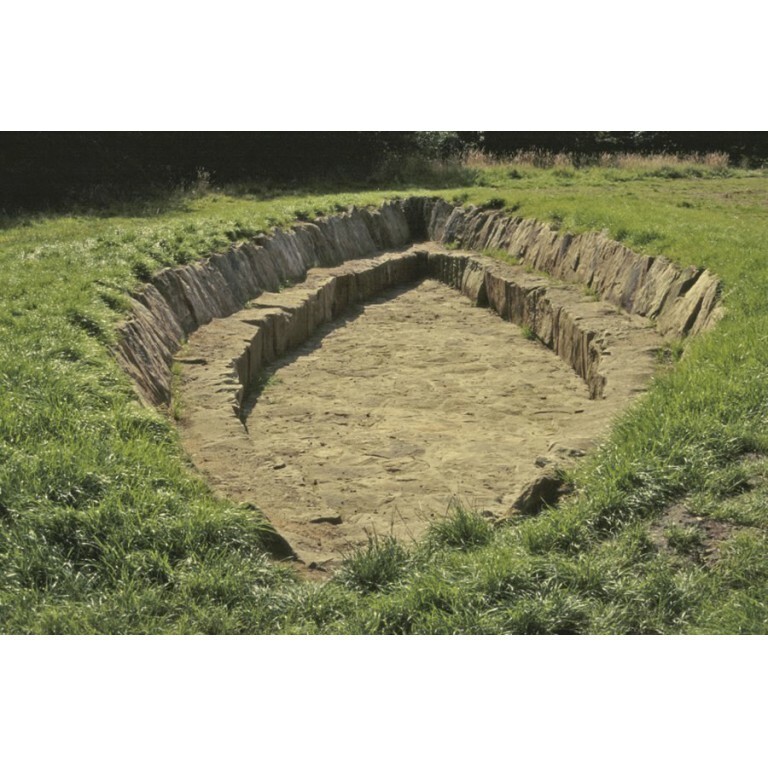 The piece was made from Haslingden Flagrock which was quarried locally cut into blocks and transported to the site. I lived and worked on site on and off for a year whilst researching and drawing. The work is now used as a seating and performance area. Commission: Irwell Sculpture Trail. Clifton Country Park, near Manchester.